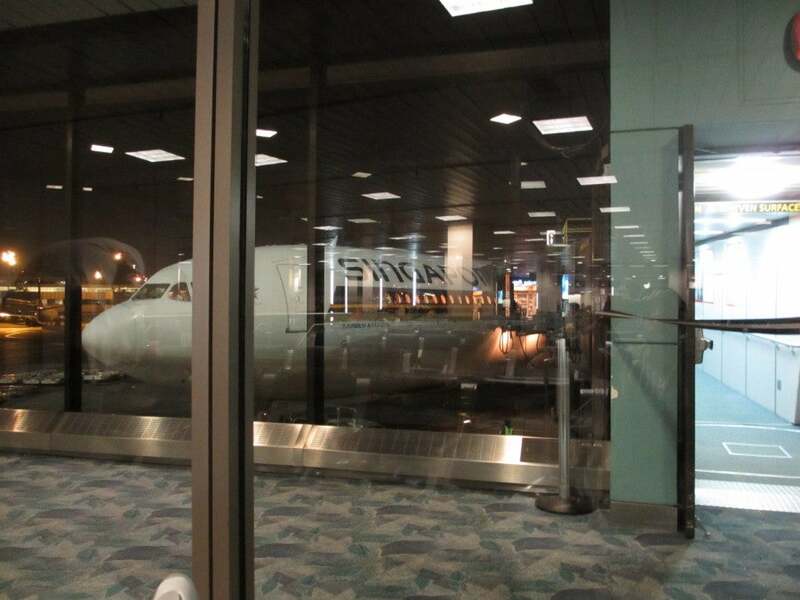 I survived the trip, and as promised, I’m going to take you aboard the world’s longest commercial flight, Singapore Airlines Flight 21 from Newark to Singapore, and what exactly I spent those 18 hours and 30 minutes doing. Hanging in the SAS Club Lounge at Newark, which Singapore Airlines shares with SAS. I got to the airport fairly early, so after check in and security, I headed to the SAS Club Lounge, which Singapore Airlines shares with SAS at Newark. The lounge itself is nothing to write home about. My biggest pet peeve was that the lounge wifi was worse than a 56k dial-up connection – good thing I brought my Verizon MiFi. The food selection was basic cheese and bread and the only beer choices were Miller Lite or Budweiser (seriously). At 9pm Singapore catered a hot buffet which had decent chicken and rice, but I actually enjoyed hanging in the terminal by the gate more than the lounge. There’s our plane! 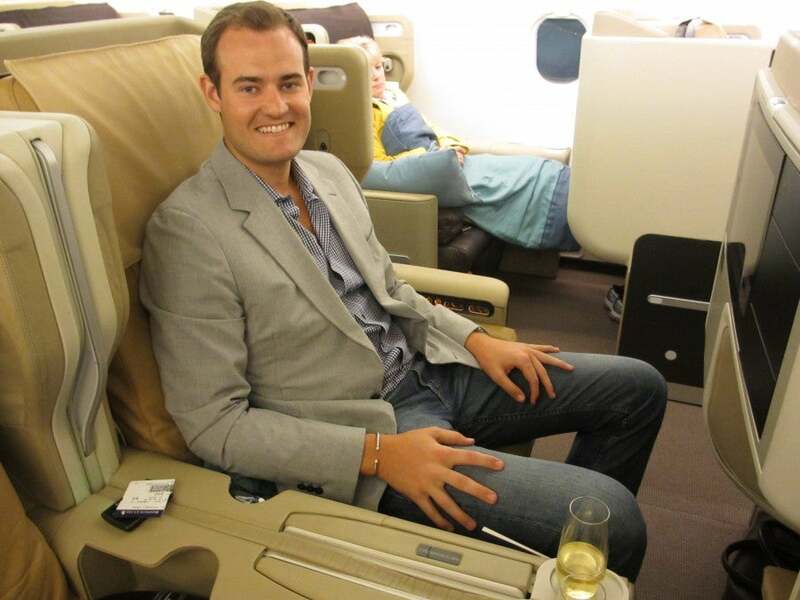 It’s an ultra-long-haul A340-500 with just 100 business class seats…and tons of jet fuel. Boarding was painless- they started with Singapore elites and then boarded the back and front first, then middle (which is where I was at row 25). It was all smiles from everyone at the gate, including someone holding a basket of Hersheys kisses welcoming you on board. Flight attendants greeted us warmly and offered to take jackets and make pre-departure drinks. My seat for the next 19 hours! 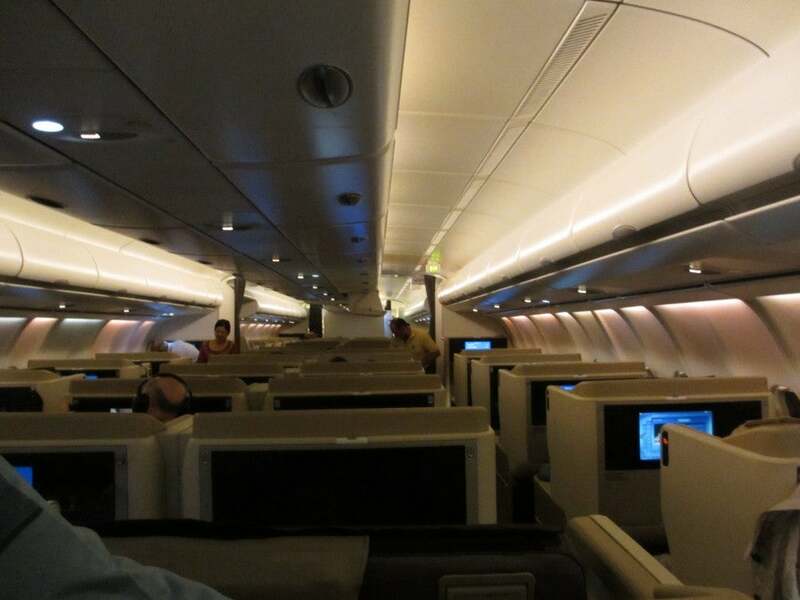 One of the interesting things about this flight is that it is an all-business class A340-500. That’s right, there’s no first class, and there’s no coach (though I don’t know if anyone could manage a flight this long in coach anyway!) aboard this plane, and altogether, there are just 100 seats total in a 1-2-1 configuration, so there’s direct aisle access for everyone, and no climbing over a neighbor to get to the bathroom. Found my seat! I’m excited to be flying in Singapore’s all-business class A340-500. The seat colors variate between a caramel color and a darker brown, so it’s fairly bright cabin. Each seat is 30 inches wide with 64 inches of pitch that reclines to a fully lie-flat position—the seatback kind of flips forward so you sleep on the cushier back surface of the seat. The seat folds down to a lie-flat bed with a cover, duvet and pillow. The bed is designed with a footrest cubby in part of the seatback in front of you, so you are supposed to sleep diagonally. The footrest of the person behind you actually takes up a part of where your head and shoulders are supposed to go, so it’s a bit of an odd diagonal scrunch that still didn’t allow me to stretch out fully, but I did like that it was actually horizontal. 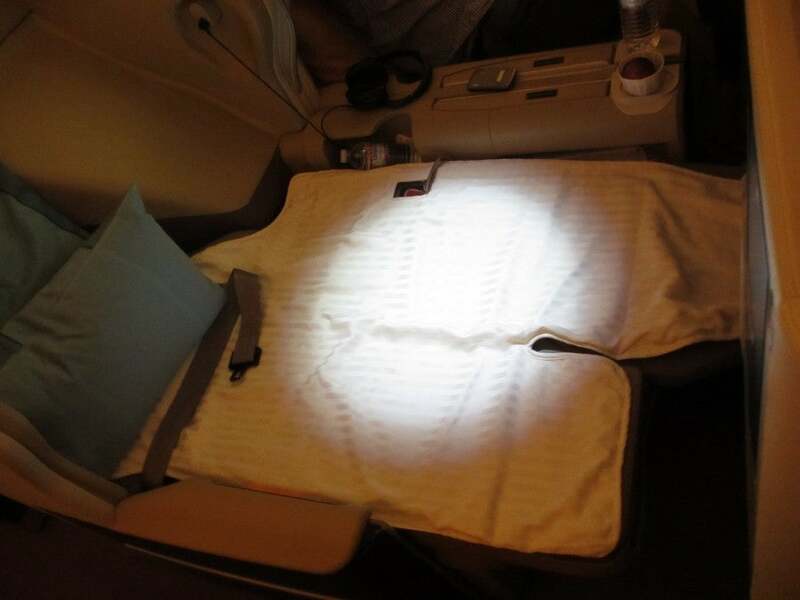 You are given a soft seat cover, a light duvet and a medium-size pillow to sleep. My seat’s foot rest and in-flight entertainment screen with all kinds of ports and plugs. Entertainment screens are mounted in the preceding seatback, are 15.4 inches and have USB docking ports, iPod docks, A/V cord ports and universal power ports for charging everything. They’re loaded with the usual array of movies, TV shows, music and games. My main course: Thai-style duck with mixed vegetables and rice. Like the service, the food onboard was pretty much impeccable. 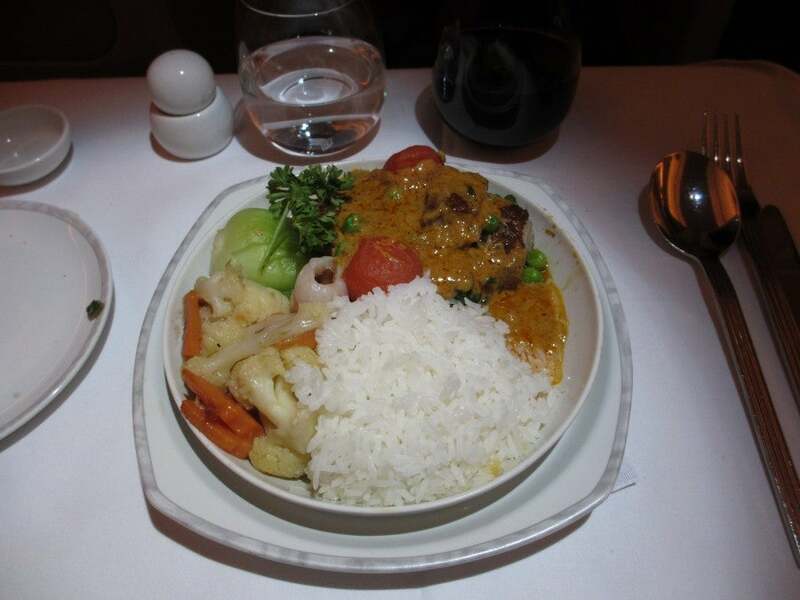 I wasn’t sure exactly what the optimal timeline for the flight would be, so I stayed awake to eat dinner and experience Singapore Airlines’ menu before trying to get a good night’s sleep. 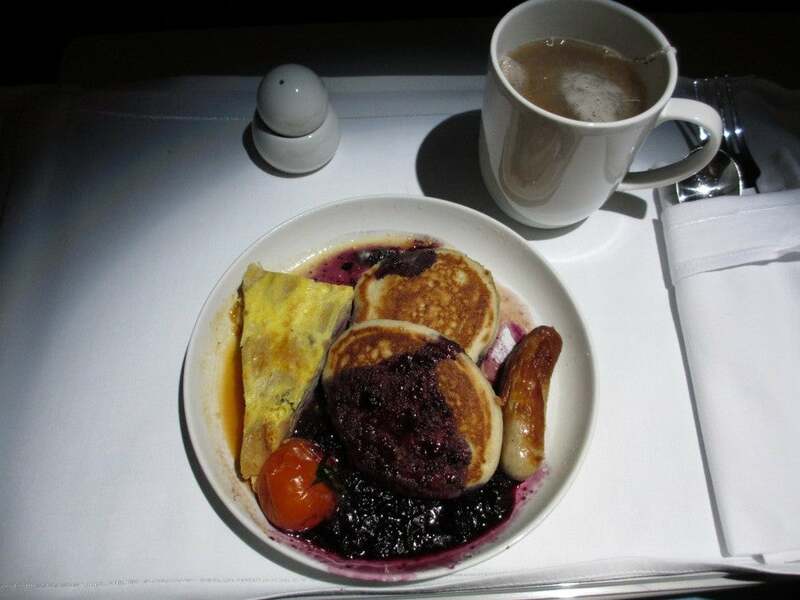 Dinner service began a little more than an hour into the flight. For an appetizer, they served seared ahi tuna with heirloom tomatoes, greens, cucumber and balsamic dressing. My main course was Thai-style duck with mixed vegetables and rice, while the other main course choice was marinated beef with corn-potato buree and veggies. For dessert I had chocolate mousse in a chocolate-covered hard shell with fruit topping. 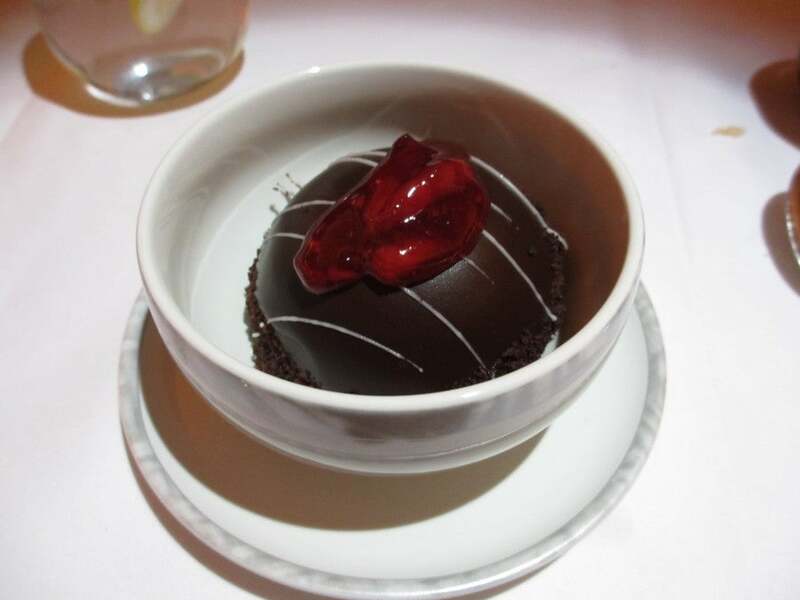 For dessert: chocolate mousse in a chocolate-covered hard shell with fruit topping. After sleeping for several hours, I woke up feeling thirsty and somewhat hungry, so I ordered a mid-flight snack of noodles with veggies and chicken and downed a few glasses of water to stay hydrated. My friend next to me ordered the Dunkin’ Donuts and they actually came around with a box of actual Dunkin Donuts to choose from. 2.5 hours before landing it was time for breakfast. Flight attendants brought around fresh fruit platters and then for breakfast itself, there was the choice of an omelet with Brie, chives and spinach, and sides of chicken sausage, potatoes and glazed mushrooms, but I wasn’t feeling up for breakfast, so I had the halibut instead with gnocchi and fresh vegetables instead. A shot down the main cabin. 1) Amenity kits were bare- just foot booties and an eye mask. I would love to see Singapore give pajamas for this flight (thankfully I brought my British Airways First PJs) as well as personal skincare products. There were toothbrushes and shaving supplies in the lavatories, but having a nice personal kit would be better and I can’t imagine it costing all that much to implement (I mean come on, Alitalia has an amazing Bulgari kiton their long-haul flights). 2) The seat itself: It was super wide, but short. I personally prefer Delta’s 777LR business class lie-flat beds and Cathay Pacific business class, which are thinner, but longer. I also found storage area to be limited and felt a bit disheveled placing all of my items below the seat. Jetlag is generally easier when going from the US to Asia than the other way around, but I was still expecting to get hit with a 2×4 late in the day since we arrived at 5am. However, after a hot shower and relaxing for an hour or two, I was fully productive the first day in Singapore and with the help of an afternoon disco nap, I even went out to a nice diner at Marina Bay Sands and got on a normal sleep cycle for day 2 (currently half way through day 2 and feeling great). So overall, I had a great experience- especially considering that I only spent 60,000 points and $2.50 (earned from signing up for the Chase Sapphire Preferred and transferring to United). 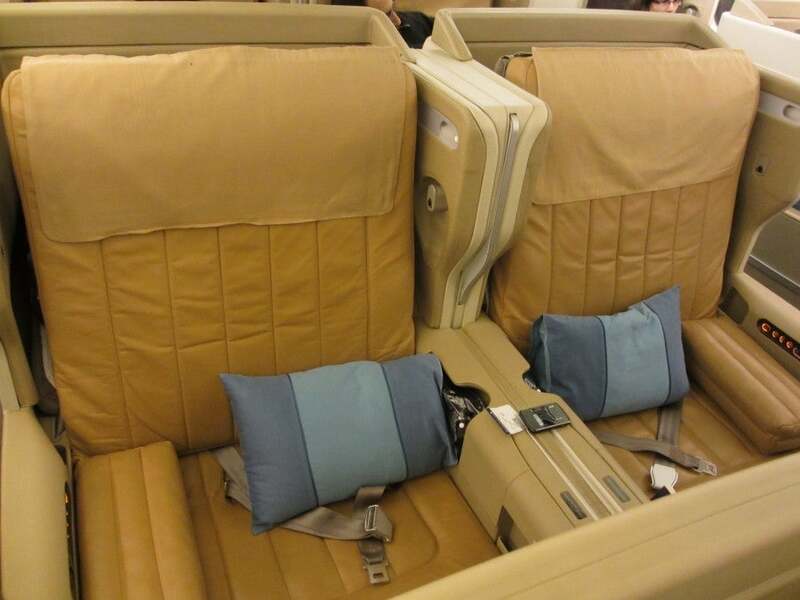 I’m flying Cathay Pacific First class home from this trip, so stay tuned for that report, plus a couple intra-Asia legs on not-so glamorous carriers! 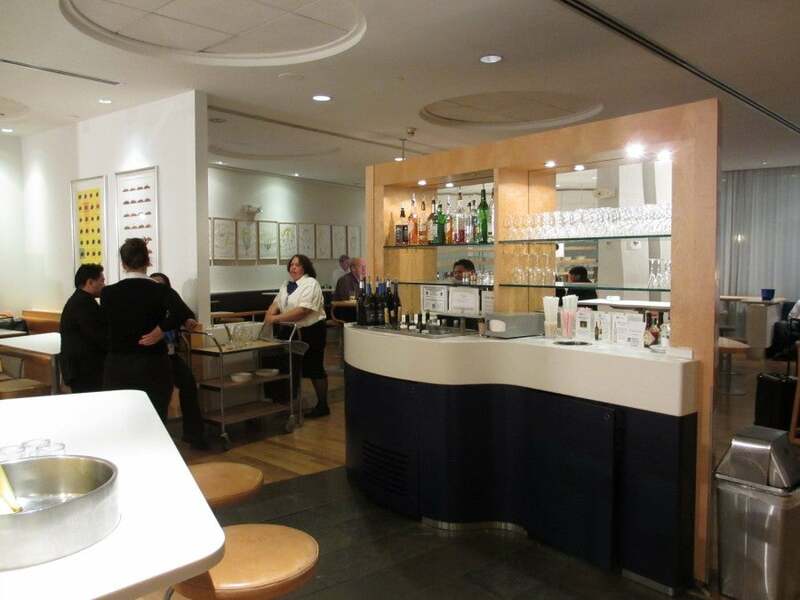 The small casual dining area at the SAS Club Lounge at Newark. My seat for the next 19 hours! They call this color caramel, but I say it’s more orange taffy. The control handset for the entertainment system, and seating and light controls in the armrest. 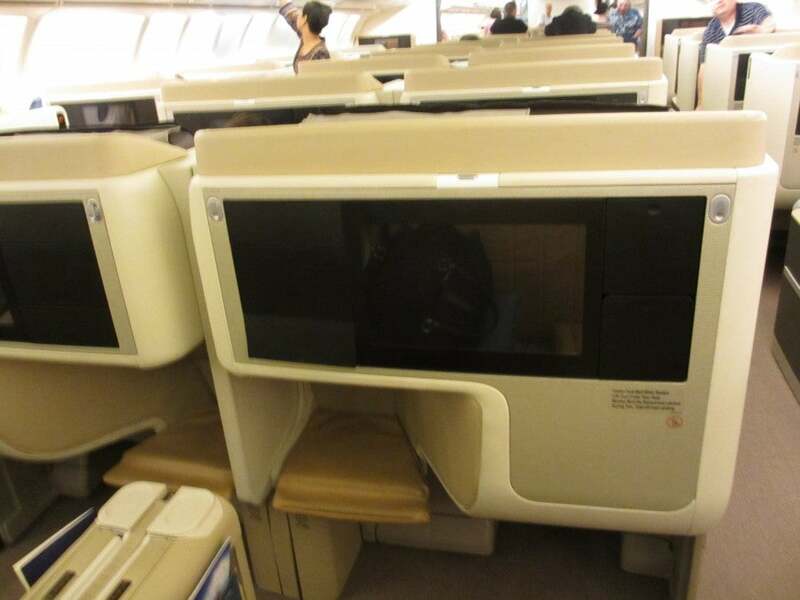 The in-flight entertainment screen is mounted in the preceding seatback and is 15.4 inches. For an appetizer: seared ahi tuna with heirloom tomatoes, greens, cucumber and balsamic dressing. The other main course: marinated beef with corn-potato buree and veggies. The in-flight movie selection on the seatback 15.4-inch LCD screens. A mid-flight snack of noodles with vegetables and chicken. An assortment of Dunkin’ Donuts served as a snack. Priming the palate with a pre-breakfast fruit platter. Another breakfast option: a short stack of pancakes with fruit puree and egg quiche. Breakfast option 2: an omelet with Brie, chives and spinach, and sides of chicken sausage, potatoes and glazed mushrooms. Breakfast: Tilapia with gnocchi and mixed vegetables. Almost there according to our flightpath tracker! A shot down the main cabin as we deplane.